Beta Dwarf is a small studio based in Copenhagen. 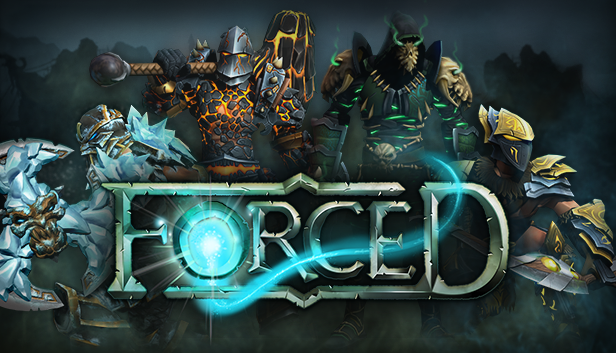 Today they released their first game, Forced, via Steam. The game is an action arcade game with a heavy focus on cooperative play and puzzle solving. It's an engaging and challenging mix that will keep players on their toes for hours. It's a wonderful debut for team that has worked so hard and come so far. Beta Dwarf started as eight people working and living illegally in an unused university classroom. After being discovered some seven months later, the growing team pooled their resources and launched a Kickstarter campaign to get them into the small studio they now call home (literally). Their team went to serious extremes for this game, and their three years of effort have paid off. Most of the time I spent playing Forced was in the single player campaign. The game's campaign pits you against the monsters and traps of the Arena. 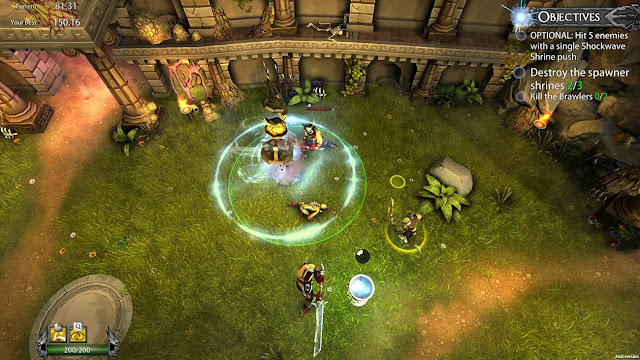 At the start of the game, you are greeted by your guardian, a small wisp-like ball of light who acts as a narrator, trainer, companion and puzzle mechanic. His voice is dry and matter of fact, but amusing and likable. It reminds me of the narrator for the tutorials in Myth; The Fallen Lords. You can guide the Spirit Mentor around each arena. Moving him over various shrines can open new areas and cause him to cast various offensive and defensive spells. Learning how to use these abilities fluidly takes a lot of practice, and can be frustrating at times but can shave a great deal of time off your encounters when utilized properly. One of my favorite of Forced is it's capacity for local co-op using only a single computer. Forced supports up to four players locally and is compatible with a number of different controllers. The game works best when played with a friend and a couple controllers. Mouse and keyboard work just fine, but the game's movements schemes and style seem best suited to a controller. I've always favored local co-op over online play, and Forced is no different. The single player experience is good, but pales in comparison to the co-op play. Before entering each arena, players are given an opportunity to choose from four different weapons. Each one offers a different combat style. hitting enemies builds up "Marks" on them which increase the effectiveness of your characters special ability. As you progress, you unlock more abilities, both active and passive, but you can only ever have one of each equipped in a match. These abilities are unlocked simultaneously for each class, so you never experience any loss of combat effectiveness when switching up your style. Setting up strategies and combat abilities with your fellow players is really key to making the most of your time in Forced. Each arena offers different challenges, and some of the challenges it throws at you will test the extent of your teams coordination and communication. Forced is a modern Gauntlet. From start to finish, it's well paced, challenging and smart. Some of the mechanics take time to master, and the single player campaign can feel a little lonely, but given time and a few friends to play alongside, Forced is a truly memorable experience.